G. Alan Joel’s “Witchcraft Spell Book: The Complete Guide of Witchcraft Rituals & Spells for Beginners” is a how-to book that presents witchcraft and magic as hypotheses for readers to test for themselves, taking nothing on "blind faith." 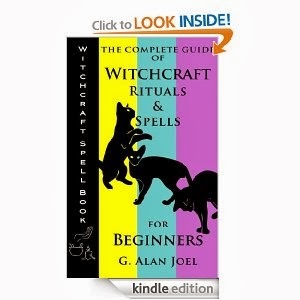 A compilation of G. Alan Joel's series, "Witchcraft Spell Books," this beginner's manual includes some history on witchcraft, practitioner testimonials, definitions of terms, and complete instructions for the practice of 27 spells and rituals involving the four elements of the Universe: Air, Water, Fire, and Earth. Witchcraft is available for everyone to learn, and what efforts are put into the practices of intentionality, prayer, and deliberate creation, G. Alan Joel says will pay you back with interest. By practicing the "precise science" of witchcraft and adhering to its specific rules and procedures, a multitude of benefits can be realized. For example, witchcraft connects you with spirit (the keepers of dreams and life lessons), helps you remember what you want, and aids your connections with powers and beings (angels, animal totems, and Spirit guides). The greatest feature of this beginner's guide is the author's clear and honest explanation of the outcomes of witchcraft and of the science itself. Witchcraft emphasizes conscious creation and tapping into our intuitive selves, helping individuals break free from reactionary living and transform life in the ways they want. The “Witchcraft Spell Book: The Complete Guide of Witchcraft Rituals & Spells for Beginners” is perfect if you are new to the practice of witchcraft and are looking for assistance to achieve a conscious state of being.